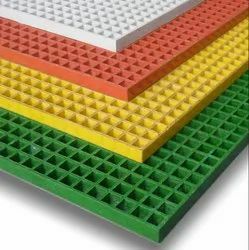 Pioneers in the industry, we offer frp gratings and product development from India. FRP Gratings are provided in a comprehensive range, which is high in quality and efficiency. Our range of FRP Gratings comprises of FRP Stair Tread Gratings, Covered FRP Gratings, Concave Surface FRP Gratings and Gritted Surface FRP Gratings. These FRP Gratings are used for various industrial applications. The FRP Gratings can be availed from us at the most competitive prices.